Use this framework to discover and document climate hazards, then develop workable solutions to lower climate-related risks. Watch the overview video or click any step to learn more. Explore case studies to see how people are building resilience for their businesses and in their communities. Click dots on the map below to preview case studies, or browse all case studies by clicking the button below the map. Municipalities can check how U.S. cities rank on climate risk and readiness. The tool can help cities make informed choices about local-level adaptation and planning strategies. 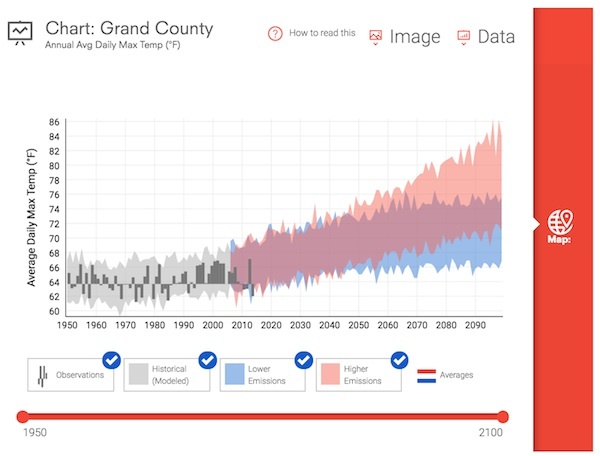 This visualization tools generates interactive graphs and maps showing climate projections and observations for any county in the contiguous United States. You can also explore historical temperature and precipitation observations at hundreds of climate stations, and view observed and projected days of high-tide flooding at more than 90 coastal tide-gauge stations. Landing panel: Several buildings along Rockaway Beach in Queens, New York, succumbed to storm surge during Hurricane Sandy. Photo © Spencer Platt, Getty Images; used with permission. Visit our Buildings and Structures page to learn how climate-smart building can help make buildings more resilient to extreme weather events.